One message was clear to attendees at National Retail Federation (NRF) Retail’s BIG show in New York City this week: Retailers need to improve the in-store experience to reconnect with customers who increasingly shop online. They can achieve this by deploying mobile, Internet of Things (IoT) and analytics technology to drive exciting, personalized shopping experiences at brick-and-mortar sites, as well as make the in-store buying journey more convenient and customer-focused. “It’s all about real-time data into shoppers’ history, into inventory, even into knowing where store associates and buyers are on the floor,” says Julie Godfrey, manager of retail and food service solutions at Samsung Electronics America. In its booth on the show floor, Samsung gave attendees a demonstration of how visibility into such data, combined with everything from proximity technology to digital kiosks, can take the in-store experience to the next level — one that’s particularly engaging for the coveted millennial segment. Walking through a simulated apparel store at the Samsung booth, NRF visitors learned that they could use their stores’ mobile apps to much greater effect than they likely do today, with the help of the SapientRazorfish interactive retail platform and Samsung devices. The experience started by showing attendees what happens when a shopper enters a store with a retailer’s mobile app running on their device — say, a Samsung Galaxy smartphone. The app triggers a beacon to deliver personalized content to their smartphone based on prior purchase data. Similarly, the beacon can activate the delivery of the same curated product information to digital signage kiosks, like an 85-inch Samsung smart signage display, when the shopper walks by it. With a touch-screen overlay on the display, shoppers can browse through the suggested items and learn more details about them, just as they can via the mobile app. Analytics transforms the shopping experience. Stores are using data to connect with consumers like never before. Proximity-sensing technology can also direct a shopper’s attention to an item on the store floor that they may previously have searched for using the store’s mobile app. Booth visitors watched how a light beneath the product — in this case, a shoe — turns on when their smartphone enters the range of the beacon. They also saw how, because the shoe is tagged with an RFID chip, the customer could dock the footwear at an information station to read the tag, at which point a Samsung tablet would display more information about the product. Next came a chance to show how the actual sales process can be re-architected to improve the customer experience. As Ted Brodheim, vice president for vertical business at Samsung Electronics America, sees it, it’s time to move away from the mindset that checkout is the last stop before the exit. “You should be able to check out multiple times during your shopping experience, and mobility will change that relationship,” he says. For instance, if the buyer decides to purchase the shoe, a store associate can scan the merchandise information into a rugged Samsung smartphone from anywhere on the floor. The transaction can be completed using a mobile payment solution like Samsung Pay on Galaxy smartphones. Just tap the two smartphones together to complete the deal, and the shopper can continue looking for other goodies around the store, secure in the knowledge they won’t have to wait in a long line at the end of their shopping experience. Here’s a deeper look at how Samsung’s mobility products empower retailers to create memorable customer experiences. When customers need assistance, all they have to do is press a Help button on a digital kiosk or their app, and Samsung wireless triangulation will bring the nearest sales associate right to their side. After associates receive the notification on their tablets, they’ll have an upsell opportunity using Samsung Nexshop, which gives them insights into customer profiles and purchase histories. They can check to see if the item a customer is interested in is in stock, and if it’s not, use the technology to find similar options and push personalized recommendations to the customer’s mobile app or a digital kiosk. Brodheim also talks about how there are more back-office opportunities to move from the “black hole of data collection” to analytics that will help retailers drive a better in-store experience. As one example, data such as a heat map of store activity captured by cameras can be analyzed by Nexshop to help managers make key decisions, such as how to rearrange the floor to increase sales. 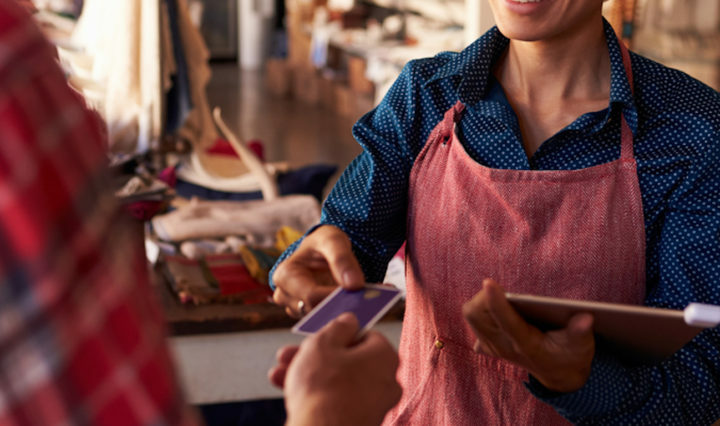 Learn how interactive digital tools can connect retailers to customers in completely new ways by checking out our retail solutions and technology page.